The Southwest Ohio Corn Growers Agronomy Field Day in Fayette County today had a large crowd and a diverse array of topics. There was quite a bit of interest in the PrecisionHawk unmanned aerial vehicle (UAV) being demonstrated. The small UAV captures aerial images to provide extensive information that has endless on-farm applications. Tyler Collins with PrecisionHawk said the planes can be used to assess plant health, tile, diseases, weed pressure and crop development. 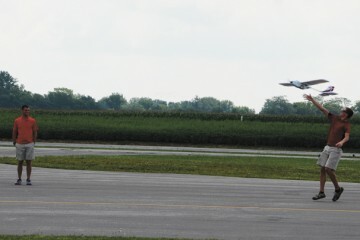 The plane is completely computer operated and costs around $25,000. 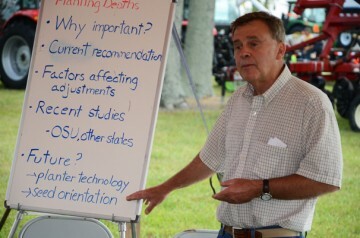 OSU Extension corn specialist Peter Thomison talked about the importance of remembering planting depth in the spring because it can affect the crop all season long. Deeper planting may be recommended as the season progresses and soils become warmer and drier. Planting shallower than 1.5 inches is generally not recommended at any planting date or in any soil type. are limited, and none have attempted to compare hybrid differences to varying planting depths. Hybrids with higher levels of drought tolerance may provide improved yield stability in shallow planted situations while also providing improved performance at normal planting depths, though this has not been documented. Attendees also got to hear from Dave Martin from Bluegrass Farms about the increasingly important Asian food grade soybean market, OSU Extension specialist Jim Hoorman who covered soil health and OSU Extension entomologist Andy Michel who talked about the future of pest management. Field Day visitors also got to ride in a plane and survey their fields from the sky in a plane the took off from the airport at the site of the event.